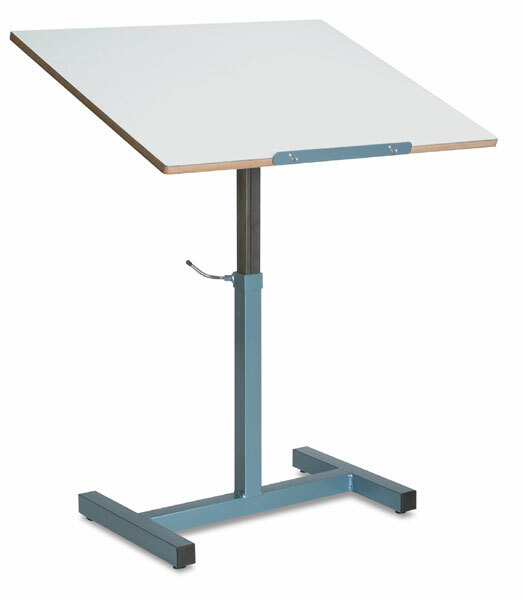 The Klopfenstein Tilt-Top Art Table, with its solid construction and versatility, is a favorite among professionals and schools. The Klopfenstein Tilt-Top Art Table features a center upright and welded base that are fabricated of heavy 2" (5 cm) square metal. The base measures 28"W × 17"D (71 cm × 43 cm) and the upright attaches securely to the base. The spring-assisted top is sturdy ¾" (2 cm) solid core melamine with a smooth surface and rounded corners. The top telescopes from 32" to 45" (81 cm to 114 cm) in height and pivots 180°. A metal edge stop keeps materials from sliding off and drops below the top surface when not in use. Dual-pivot bracket clamping knobs provide slip-proof positioning of the top at any tilt angle. Multiple tables nest together for compact storage. Assembly is required. ™ Klopfenstein is a trademark.